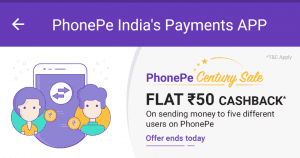 Phonepe Century Sale Rs.50 Money Transfer Offer-Phonepe is Here with Century Sale and offering may loot .we have already published about phonepe Rs.20 Gold Loot and here is another loot only for today.Phonepe is offering Rs.50 Cashback on Sending Rs.100 or More to 5 Phonepe Users only for Today 18th May. 2. Now Initiate a Money Transfer to Your Phonepe Contacts. 3. Send Rs.100 or More to 5 Friends to Get This Offer. 4. After Sending Rs.100 5 Times You will Get Rs.50 cashback in Your Phonepe wallet. 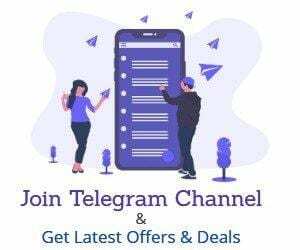 Send ₹ 100 Minimum To Different Friends & Get ₹ 50 Free. 2. Cashback is Eligible only for Mobile Recharge through UPI, PhonePe Wallet & CC/DC. 3. Cashback Will be Credited to the PhonePe Wallet within 5 Working Day. 4. Offer Valid Till 18 May 2018 12:00 Am to 18 May 2018 23:59 Hours. 5. Offer Valid On Minimum 5 Transaction per PhonePe Registered User/SmartPhone During the Offer Period and applicable for both Android and IOS Devices. 6. The transaction Must ne initiated and completed by the user within the PhonePe app. 7. PhonePe has the Right to amend the Terms & Conditions, and end the offer, or Call Back any or all its offer without prior notice. 8. in a case of dispute, PhonePe reserves the right to a final decision on the interpretation of these Terms & Conditions.